Citizen's i:Virt uses Bluetooth to warn of incoming calls. Citizen Japan may be one of the finest watchmakers this side of Tokyo, but that doesn't stop it from coming up with solutions to non-existent problems. By that we suggest that a vibrating watch that uses Bluetooth to let you know when your phone is ringing might not be all that useful. Usefulness aside, the i:Virt W700 is still a pretty clever piece of engineering and looks a lot better than Citizen's previous efforts . 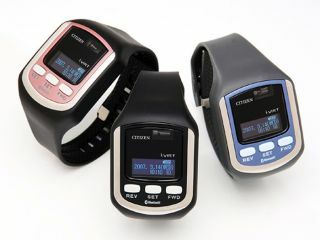 Pair it up with a compatible Japanese phone and the watch will mirror the phone by showing caller I.D. and vibrating to warn of incoming calls. It also displays contacts from the phone's SIM card and allows the copied phonebook to be password-protected from snoops. One potentially decent feature is a proximity alarm that warns of possibly forgetting the phone by going off when the Bluetooth link is broken, which should happen at around 15 metres. The W700 is likely to cost around ¥30,000 (£126) when it arrives mid-March, is available in blue, pink and black and has a delightfully retro screen that remains dark until you push the big button marked 'light me up'.